Simon Gillett of Posh and Bobby Grant of Fleetwood do battle. Photo: Joe Dent/theposh.com. Peterborough United delivered a dismal display at Fleetwood tonight (April 5). 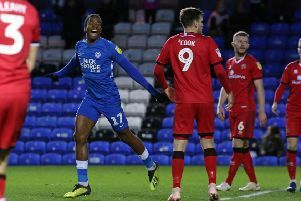 Posh boss Graham Westley was furious with his side’s display and the Peterborough Telegraph’s Posh writer wasn’t impressed either as Fleetwood coasted to a 2-0 success. Posh forward Shaquile Coulthirst battles for possession at Fleetwood. Photo: Joe Dent/theposh.com. Martin Samuelsen: (for Gillett, 64 mins). Tom Nichols: (for Angol, 76 mins).